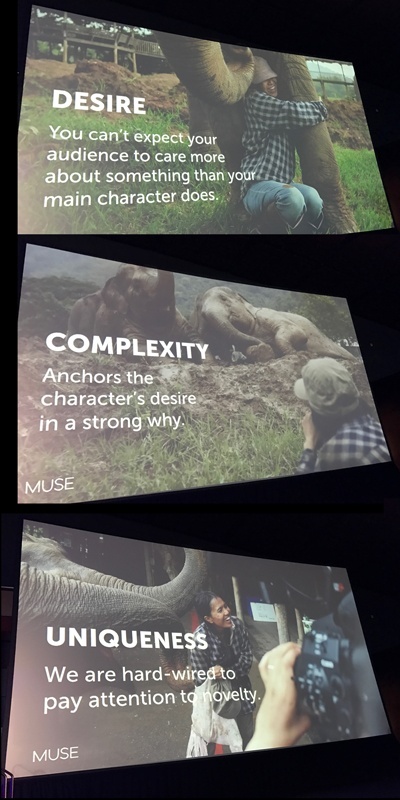 I go to a marketing conference in Boston every year, and every year I see a handful of outstanding presentations about storytelling. One stood out for me this year that will have immediate applicability for our field. The presenter, Amina Moreau, is a filmmaker and co-founder of Stillmotion. Her session, Scientific Secrets of Superpowerful Storytellers: Techniques to Spur Action, covered some topics that are particularly useful for trial lawyers looking to persuade audiences. We are constantly discussing storytelling among ourselves at A2L and with our litigation-focused client base. We've published books about storytelling, conducted webinars about storytelling (a new one is going to be announced soon), and routinely conduct storytelling CLEs at top law litigation departments. Our articles about storytelling at trial are read and shared regularly. See Dan Pink, Pixar, and Storytelling for the Courtroom, 5 Essential Elements of Storytelling and Persuasion, and Storytelling at Trial Proven to be Scientifically More Persuasive. Using neuroscience as a foundation, Ms. Moreau raised a question that we frequently wrestle with: Whom should we tell stories about to generate the most powerful call for action and to be as persuasive as possible? Should the story be about a team, should it be about the CEO, should it be about the victim's wife, should it be about the inventor? How do we make the story most meaningful to our audience? After all, if the story is not meaningful, we can't connect with the audience, and if we can't connect, we can't persuade using emotions and the framework that a well-told story provides. To illustrate her point, Ms. Moreau used an interesting example. She compared “baby Jessica” -- the child who fell in the well in 1987 and was rescued -- with 60 million undernourished and undereducated girls in Africa. She pointed out how baby Jessica generated massive donations for her college fund in just hours and how organizations around the world struggle to raise fractions of the dollars raised for baby Jessica for needy girls in Africa. This is an illustration of the identifiable victim effect, in which it is far easier for people to sympathize and to act for a specific, identifiable person rather than for vague groups of individuals. It makes sense of course. There's a compelling narrative around baby Jessica that fits all the classic storytelling elements, whereas making a rational argument about needy children in Africa is too often emotionless talk that does not impel action. Ms. Moreau offered several useful tips for deciding about whom a story should be told. In general, a story about an individual will outperform a story about a group. So when trying to find the right individual to use to tell a story, she says there are three crucial criteria to use. The same criteria can and should be used in selecting a person to focus on in a trial. Desire. People identify with a character who reaches a goal or conquers an obstacle. Passion to achieve the goal is what they start with, but it’s not enough. Complexity. Complexity is what makes us believe in the character. Complexity is what sustains the connection between the viewer and the main character of your story. It's what keeps the viewer rooting for them to reach their desire. Uniqueness. People are attracted to characters who have a novel approach to tackling the challenges that the world presents. Keep these three criteria in mind, and you will understand how to choose the character who is at the heart of your story.